Quick and easy meals are so handy, especially when it is cold outside and you want to get something warm in your tummy ASAP. Lately we have been having some pretty bad weather, the kind where you don’t even wanna go out to the grocery store. So I stayed in with a bowl of dumpling noodles. Shepherd’s Pie and a very stressful 24 hours. 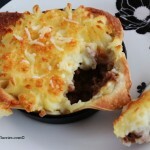 Some people call these babies a Cottage Pie, while others prefer to call them a Shepherd’s Pie. Most pies contain a filling of mince beef, while others wanna go the traditional way and use lamb … but all are topped generously with creamy, buttery potato mash and ALL are 100% honest to goodness real comfort food. After what we’ve just been thru … we need all the comfort we can get. Woohoo! This one turned out to be quite a success and the actual cake itself is bursting with flavour. 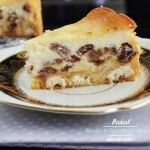 It’s a pretty special cheesecake, one that I have never tried before. But now that I have I think it will be a good one to have around for Christmas as an alternative to fruit cake and plum pudding. 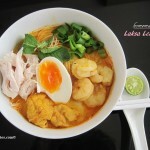 The all time heavy-weight champion of the noodle world, Laksa Lemak is top on the list in both Singapore and Malaysia. Wonderfully fragrant curry gravy is poured over fresh noodles and heavily garnished with prawns, bean curd and fresh herbs. 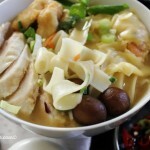 Many people would travel miles to find a good laksa stall. As with all soup based noodle dishes, the secret lies in the proper construction of your stock … fortunately there is an easy way round this. 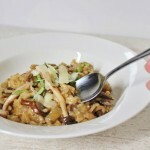 After years of shunning risottos I have finally made one of my own from scratch … and it’s all for me! No one else in my house eats mushrooms. Pah! They just don’t know what they are missing. Creamy goodness with big woody flavours, this recipe will definitely be the first one I will be turning to this fall season.